Originally reprinted by NBM in a multi-volume series, these Sunday newspaper full-page stories of the “ape-man” drawn by Hal Foster are being reissued by Dark Horse in hardcover at an enlarged size that does them justice. Veteran comic scribe and historian Mark Evanier sets the stage with a nice introduction discussing the history of Foster’s work on the strip. He started with the daily in 1929, predating the more familiar Johnny Weissmuller films that started in 1932. After breaking to work on more lucrative projects, Foster was lured back to the Sunday serial in 1931. The series ran with his art until 1937, although Evanier says that Foster worked ahead to the point that, by the time he had created Prince Valiant and both strips were running simultaneously, the artist had a couple months of material ready to go. Foster’s Tarzan was a favorite of the character’s creator, writer Edgar Rice Burroughs, who felt it rang true to his vision and strongly advocated for the artist to return to drawing the story. Foster is best known for his attention to detail, just as prominent in this work as in Valiant, and Evanier conveys his own preference for Tarzan over the better-known Medieval strip, pointing out that Tarzan includes considerably more action. There’s clear growth over the course of the three years in this volume, at least in the artwork. George Carlin’s writing is unspectacular, standard adventure stuff, although it does seem somewhat progressive for its era by featuring a character who refrains from using deadly force (an influence on Batman?). The heroic characters tend to have white features and light skin, while the villainous ones are (mostly) savage African and Arab caricatures: such was the time. The strip had an obvious impact on a rising generation of comic book creators with its Superman-esque hero, a combination of physical perfection and impeccable morality. Tarzan defeats violence through instinct, though he’s hardly short on brains, and the character is immediately recognizable as a superior specimen by his peers. The strip’s machinations are fairly transparent: lovely ladies appear and are quickly parceled out to available bachelors who happen to show up around the same time, lest this version of Tarzan settles down too quickly with his Jane. Characters rarely change their ways. But for all that, the serial produces undeniable pleasure. Foster not only creates a nice page (although the panel composition is rarely innovative), but also some individually fantastic panels. Tarzan moves like a real, anatomical person, and his fights are exciting; dinosaurs show up! And the text, mostly confined to captions isolated from the illustrations and their innate action, never detracts from the images, the strip’s major strength. Restoration of the original comic’s appearance would have been an improvement, as some pages appear overly-yellow and others, perhaps in better shape to begin with, appear crisper, but that’s a small complaint. 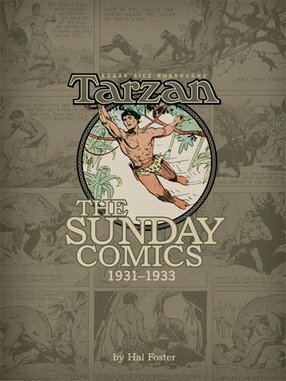 Edgar Rice Burroughs’ Tarzan: The Sunday Comics is ultimately a fine piece of history and nostalgia.